Bead embroideries and knitwork with beads can be seen in the present exhibition. 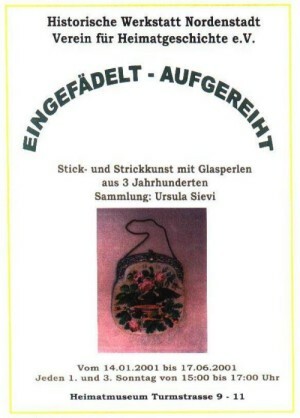 Ursula Sievi collects these objects since more than 30 years. She discovers them in fleamarkets and in antiquemarkets, and also by travelling through Germany and trough neighbourly countries. The collector is very proud of three well preserved mens waistcoats from the end of 18th c. which once belonged to a baron of Bayreuth, and of three babys christening caps. 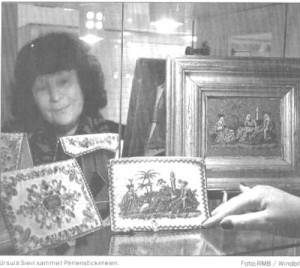 Hightime for the art of beads was the first half of 19th c. At that time almost everything was ornamented with beads: costumes, collars, caps, bags, purses and pouches and also souvenir books. It seems that visitors like escpecially the pieces from the early 20 th c., as they very often still have in memory the purse or other items of their grandmothers.